Joe Fogarty turned to professional basketball immediately after graduating from Catholic High School in Philadelphia where he starred in football, basketball and baseball. At age 18, he led the American Basketball League, a Philadelphia minor league in scoring. By the next season, he was among the top-five scorers in the very fast New England Basketball League. One of the most accurate shooters of his era, Fogarty intimidated opponents with a combination of speed, strength and intelligence that was unmatched in the early years of pro basketball. He was one of the first players to score a 1,000 points in a single season and he was the first player to reach 10,000 career points. Early in his career he has an amazing run of seven consecutive championship in five leagues: Camden, 1902-03 National League; Springfield, 1903-04 Western Massachusetts League; South Framingham, 1903-04 New England League; Natick, 1904-05 New England League; DeNeri, 1905-06 Philadelphia League; East Liverpool, 1906 07 and 1907-08 titles in the Central League. 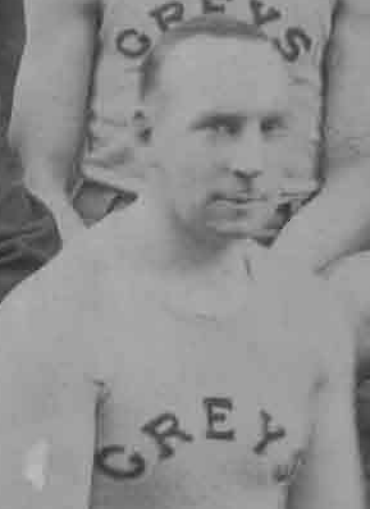 Starting with the 1908-09 Johnstown team in the Central League, and for the rest of his career, Fogarty always acted in the role of player-coach of his team. In thirteen seasons, he posted a .598 winning percentage when in charge of a team and added two more championships to bring his career total to nine championship teams. Fogarty also coached college basketball at three schools, Lafayette, Muhlenburg and Swarthmore, while still active as a player. Fogarty’s final coaching position was a three-year stint at Yale University that ended with his death from pneumonia in 1925. Fogarty ranks as the greatest scorer and most successful player in terms winning games and championships in the first 20 years of professional basketball, and yet somehow he was never elected to the Basketball Hall of Fame. Joseph John Fogarty Born: Mar 7, 1884 Died: Aug 15, 1925 Hometown: Philadelphia, Pa.